Cephalometry started with Ian Donald in Glasgow around 1961. Measurements were made 'blindly' using the A-mode scan.
" ..... Following up the idea of measuring the distance between the powerful echoes between the two sides of the foetal head, as already seen in the Royal Maternity hospital, a series of tank experiments with a foetal skull showed that these echoes were simultaneously obtainable only when the beam of ultrasound went through the biparietal diameter at right angles to the sagittal plane. At first we had to measure this biparietal diameter in the intact pregnant patient by using a water tank comparator and making a correction for the speed of sound through water as compared with a foetal head, the latter being calculated at 1540 m per sec. I reckoned it was only possible to get two strong echoes simultaneously when the beam of ultrasound crossed the true diameter of the head and not a chord thereof and described the rationale in April 1961 to the British Institute of Radiology, and published in a joint paper with Tom Brown in the British Journal of Radiology some months later. Dr. Willocks meanwhile developed great skill at handling the probe manually and proceeded to study the rate of foetal growth as measured by the biparietal diameter week after week. Not only did be show the importance of foetal growth rates in relation to clinically disabling conditions as far as foetal development was concerned, but he also demonstrated the shrinkage in the dimensions of the head which occurs in the first day or two after birth, presumably due to the loss of fluid. Meanwhile Mr. Tom Duggan had been working to produce electronic cursors in other words 'bright-up' points which could be superimposed on the echo blips from the two sides of the baby's head. These were coupled to a set of dials which were ultimately calibrated in centimetres and millimetres. Even in 1961 we reckoned to be within 1 mm of the true biparietal diameter in 75 per cent of cases and an error of more than 2 mm was classed as a thoroughly bad result....... ". A-scan measurement of the BPD was reported variously soon afterwards including work from Thompson, Taylor and Gottesfeld in Denver, Hansmann in Germany, Kratochwil in Austria, Mizuno in Japan, Goldberg in Pennsylvania and and Von Micsky in New York. Stuart campbell's combined A- and B- scan setup in the late 1960s. At that time the A-scope (a Mk 7) and the B-mode display were housed differently not like in the later revamped version in which both are housed together in a much smaller control console. "........... Measurement of the fetal biparietal diameter is the most commonly made and the most precise measurement that can be obtained during the antenatal period. At least one cephalometrv scan is performed on 60 per cent of patients attending Queen Charlotte's Hospital. I . A longitudinal scan is made to determine the angulation of the fetal head to the verticai axis (angle of asynclitism). This is determined by placing the ultrasonic beam at right angles to the midline echo and reading the angle from a scale. The midline echo (which represents the medial aspect of each cerebral hemisphere) is strong when the head is occipito-transverse and becomes progressively less distinct the more the occiput is rotated anteriorly or posteriorly. Rotation means that the midline structures are being recognised by means of diffuse backscatter. 2. A transverse scan is then made with the probe inclined to the angle of tilt of the head (asynclitism). This scan should give a true transverse section of the fetal head. The head is seen as an ovoid and a complete midline echo will bisect it in its longest axis. Thc ultrasonic beam is then placed at right angles to the midline echo across the maximum convexity of the parietal bone and an A-scan measurement taken. Further transverse scans are thcn made caudal and cephalad to this original transverse scan to establish the widest transcoronal diameter (which should be the biparietal diameter) with the provison that the midline structures are still visible on both B and A-scan displays. 3. If the back of the head (occiput) is directly postcrior or anterior then no midline structures can be visualised on the longitudinal scan and the angle of asynclitism cannot be measured. Gentle lateral pressure on the fetal head or body is then indicated in order to bring the midline structures into view. A transverse measuring scan at the appropriate angle with a similar degree of lateral pressure is then performed. 4. If the head is deeply engaged, cephalometry is difficult, due to the interposition of the symphysis pubis which physically limits the range of the scanning angles, lifting the foot of the scanning couch by 20 degrees will dislocate the head upwards making cephalometrv much more rapid and simple. 5. In cases of breech presentation the technique is no different from that described above but the movement of the head tends to be greater due to the respiratory excursion of the maternal diaphragm. it is then advisable to ask the patient to hold her breath intermittently while angles are measured and measurements taken. When the fetal lie is transverse the procedure is performed in reverse: the angle of asynclitism is assessed on the transverse scan and the measuring scan is performed longitudinally. 6. Measurement in early pregnancy can be difficult because of fetal movements. Violent movements rarely last longer than three or four minutes and the wisest course is to resume measurements only when the fetus is in a resting phase. Good midline echoes can be obtained in 98 per cent of examinations. Assessment of the a accuracy of cephalometry by the above technique was carried out on 35 babies delivered by elective caesarean section and 50 fetuses delivered by hysterotomy. In 90 per cent of cases the discrepancy between the ultrasonic and post-natal caliper measurements was less than 2 mm and the mean error in both groups was less than I mm. In the later study three independent ultrasonic recordings were performed on each fetus and the average standard deviation was +0.25 mm indicating a high degree of reproducibility...........". Excerpted from "Fetal Growth" by Stuart Campbell. In the book - Fetal Physiology and Medicine. Richard Beard and Peter Nathanielsz, Editors. WB Saunders 1976. Many early papers in cephalometry followed in the late 1960s such as those from Boog in France, Khentov in the USSR, Zacutti and Brugnoli in Italy, Kratochwil in Austria and Pystynen and Ylostalo in Finland. Establishing charts for individual population. Defining the errors that are associated with the meseasurement. The effect of different tissue velocity calibrations. The effect of using different types of machines in the measurement. Campbell and Newman published their first chart of the BPD in relation to gestational age in 1971. The Diasonograph®, a static scanner without grey scale was used, and the method was heavily based on the use of the A-scan. The sound velocity was calibrated at 1600 m/s. (Nowadays most machines are calibrated at a velocity of 1540 m/s). Although it had been thought that BPD measurements obtained with bistable, gray scale, or real-time techniques might be different, several studies have shown no statistical differences between these methods from real-time ultrasound technology certainly allows one to obtain a satisfactory plane for measurement more rapidly. Visualization of intracranial structures with gray scale technology provided a standard level for measurement and allowed more accurate comparison of results obtained from different centers and different populations and also more reliably allowed assessment of BPD growth from sequential studies in any particular individual. In 1972 the European Study Group of Fetal Biometry by Ultrasound was formed comprising of Stuart Campbell, Malte Hinselman, Hans Hollander, Alfred Kratochwil and Salvator Levi. The group looked into the standardization of fetal measurements and the problems mentioned above. The use of the Thalami and Cavum Septum Pellucidum as landmark fror measuring the BPD was described in the American College of Obstetrics and Gynecologists Technical Bulletin, Number 63 in 1981. This was further discussed by Frank P Hadlock in an article which appeared in the American Journal of Radiology in 1983. Various endpoints for placing the calipers have also been looked at by different centers (ie, measurements from leading edge to leading edge, leading edge to trailing edge and middle-to-middle measurements), it appears that because of the wide variation of normal measurements at any particular gestational age that the method of measurement does not materially affect the results obtained. The most commonly accepted method and the one that would be expected to have the most precise end points for measurement is the leading edge to leading edge (outer-to-inner) measurement. Up to this day there are at least 400 charts in used (information supplied by commercial ultrasound scanner venders who sets up the charts for their clients). Important early workers who particularly published on BPD chartings include Rudy Sabbagha at the Northwestern University, Chicago, Alfred Kurtz at the Thomas Jefferson University, John Hobbins at Yale, Charles Hohler at Phoenix, Arizona, Peter Cooperberg at the University of British Columbia, Canada, David Graham and Roger Sanders at Johns Hopkins, Baltimore and Frank Hadlock and Russell Deter at the Baylor College of Medicine, Houston, Texas. These investigators had published extensively on normograms looking from different angles and from various parts of the world. From left: (top row) Rudy Sabbagha, John Hobbins, Peter Cooperberg. (bottom row) Roger Sanders, Alfred Kurtz, Charles Hohler. 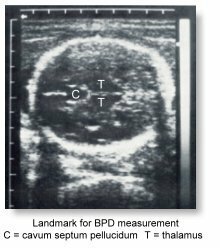 In the early days of BPD measurements, interobserver error can be as high as 14-15 percent of patients and was on the order of ±1 mm compared to the overall mean. some studies yielded standard deviations at the 70 percent confidence limit of up to 2.6 mm. The effect of this magnitude of error (±2 SD 5.2 mm) is dependent on gestational age. Near term, however, with significant slowing of the fetal head growth a normal finding, the discrepancy would be much greater and approach as much as ±4 weeks. In a study of 17 different BPD charts, Alfred Kurtz considered differences in patient populations as a possible factor in the differences seen between some of these charts. However, since no individual study was found to have either consistently higher or consistently lower BPD measurements, this was not considered to be significant factor. Sabbagha, in a study of measurements from four B-scan studies showed that the composite BPDs, derived from all four groups did not differ significantly from the BPDs in each group. The use of different normgrams however can post a difference of up to 2 weeks in gestational age calculations. Since the mid-1980s BPDs were measured on real-time scanners using on-screen calipers. The measurement was no longer considered as an important parameter in the assessment of gestational maturity in the late second and third trimester. At that gestation, Its usefulness had shifted to its deployment in weight-predicting equations. Some historical notes on the Abdominal circumference is here. * "Sonar -- the Story of an Experiment" by Professor Ian Donald which appeared in Ultrasound in Medicine and Biology, vol 1 pp109-117, 1974.